Simulation results of solute transport in a bifurcated fracture, using the Lattice Boltzman simulation package LBHydra. 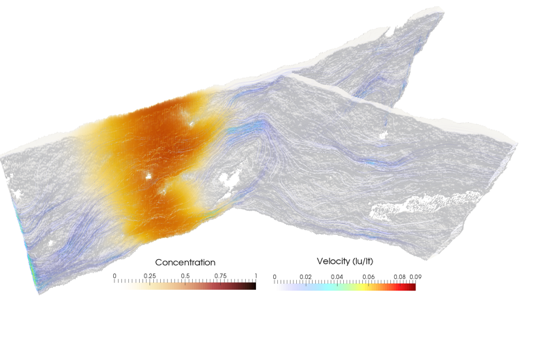 Simulations at the pore, lab, and field scales constitute part of our research work. Typically, they involve subsurface multiphase fluid flow, heat transfer, reactive transport, and geomechanics, with applications in such fields as geothermal energy, subsurface carbon dioxide storage, groundwater, oil/gas. Pore-scale simulations (like the figure on the left) improve our understanding of fundamental processes. 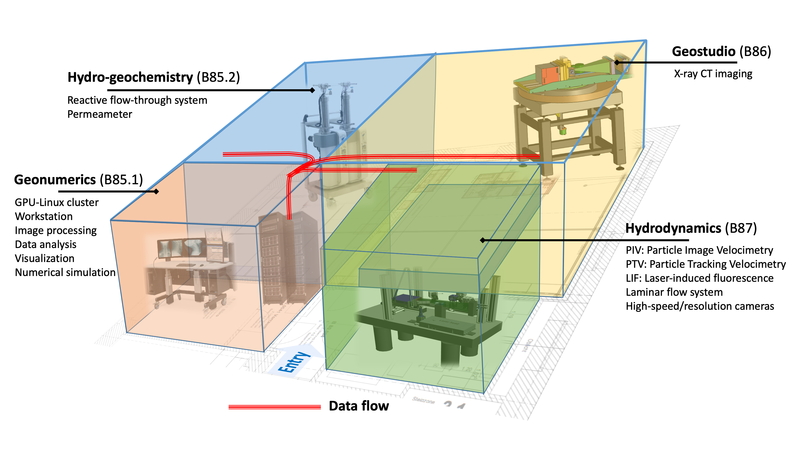 Lab-scale simulations accompany our laboratory experiments. Simulations at the field scale help address concrete application-based questions. Our Geosystem REActive Transport (GREAT) Visualization Lab, a groundbreaking, worldwide unique laboratory, investigate reactive transport through a porous and/or fractured medium at sufficient spatial and temporal resolutions. The GREAT Visualization Lab enables new research opportunities regarding reactive transport in porous and/or fractured media, as often encountered in geothermal, subsurface nuclear/CO2-waste storage, and groundwater systems as well as in many other (geo-)science and engineering fields. We are involved with the Swiss Competence Center on Energy Research – Supply of Electricity (SCCER-SoE) and its Deep Underground Geothermal Laboratory (DUG-Lab) at NAGRA’s Grimsel Test Site in the Swiss Alps to conduct hydraulic stimulation experiments of Enhanced Geothermal Systems (EGS). We are employing electromagnetic methods to a) explore for and develop geothermal reservoirs and to determine the distribution of geothermal fluids in mid-enthalpy systems such as those found e.g. in the North of Switzerland and b) determine stimulation-based increases in electrical conductivity and thus permeability and heat transfer characteristics. For more information, please click on Field Investigations.